We are a church centered on the unique Gospel of Jesus Christ, animated by missions and evangelism, grounded in the 2,000 year tradition of Christian faith, and organized chiefly to serve our congregations. The NALC is a renewed Lutheran community moving forward in faith, focused on living out Christ’s Great Commission to go and make disciples in North America and around the globe. 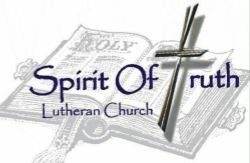 Spirit of Truth believes in tithing of our offerings. Three percent is given to the NALC (North American Lutheran Church, www.thenalc.org ) with the other 10% being given to the 3 different regions the Bible calls us to; local, regional & national, and international). What a privilege we have to be part of such a giving congregation and a “mission-driven church family in the NALC. Our mission is to reach out to our local area, our state and national missions and overseas (to the end of the earth). Thus, our missions include local organizations such as Brandon & Garretson Food Pantry, Meals on Wheels, Faith Temple Food Giveaway, St. Dysmas prison ministry, St. Francis House, The Center of Hope, Sioux Falls Ministry Center, Serve Sioux Falls, and the Union Gospel Mission, all in Sioux Falls etc. We also reach out to our state through missions on the Indian Reservation(Hands of Faith and White Eagle Academy), Pickerel Lake Bible Camp, Christian Radio, Teen challenge of the Dakotas, and Feeding South Dakota Backpack program for Brandon. We reach out to the world through Voice of the Martyrs, Samaritan’s Purse, the Gideons, Salvation Army, Mission Haiti, Samaritan’s Feet, Robin’s Nest children’s home, Jamaica Christian school for the Deaf. and Green Heights church in an impoverished area of Jamaica. We try to send a mission team to Jamaica each year and also serve at the “Feast of Nations” on the Rosebud Reservation.